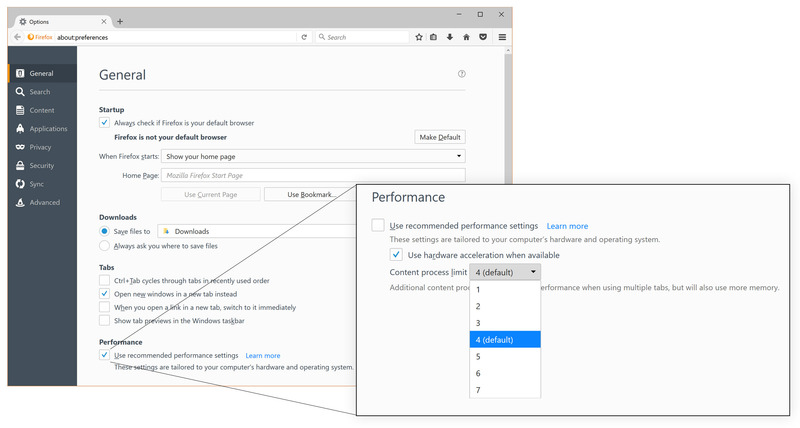 On top of Firefox’s new super-fast multi-process foundation, today we’re launching a breakthrough feature that expands the web to an entirely new experience. Firefox for Windows is the first desktop browser to support WebVR for all users, letting you experience next-generation entertainment in virtual reality. WebVR enables developers and artists to create web-based VR experiences you can browse to with Firefox. So whether you’re a current Oculus Rift or HTC Vive owner – or still deciding when you’re going to take the VR leap – Firefox can get you to your VR fix faster. Once you find a web game or app that supports VR, you can experience it with your headset just by clicking the VR goggles icon visible on the web page. You can navigate and control VR experiences with handset controllers and your movements in physical space. For a look at what WebVR can do, check out this sizzle reel (retro intro intended!). If you’re ready to try out VR with Firefox, a growing community of creators has already been building content with WebVR. Visit vr.mozilla.org to find some experiences we recommend, many made with A-Frame, an easy-to-use WebVR content creation framework made by Mozilla.. One of our favorites is A Painter, a VR painting experience. 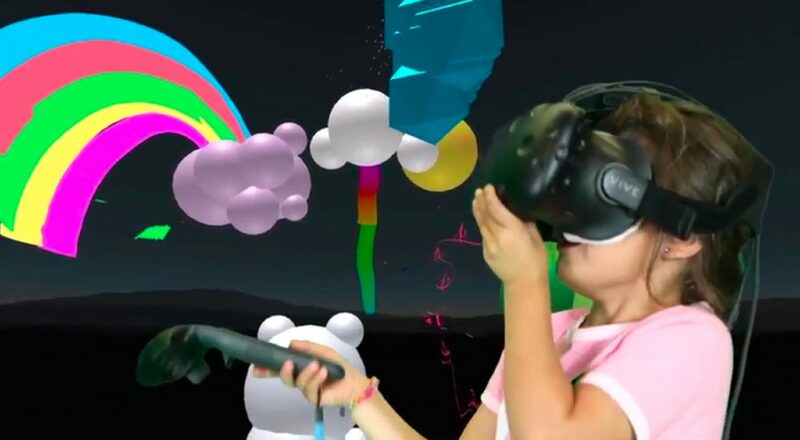 None of this would have been possible without the hard work of the Mozilla VR team, who collaborated with industry partners, fellow browser makers and the developer community to create and adopt the WebVR specification. If you’d like to learn more about the history and capabilities of WebVR, check out this Medium post by Sean White. Our new multi-process architecture allows Firefox to easily handle complex websites, particularly when you have many of them loaded in tabs. We believe we’ve struck a good balance for most computers, but for those of you who are tinkerers, you can now adjust the number of processes up or down in this version of Firefox. This setting is at the bottom of the General section in Options. Tip: if your computer has lots of RAM (e.g., more than 8GB), you might want to try bumping up the number of content processes that Firefox uses from its default four. This can make Firefox even faster, although it will use more memory than it does with four processes. 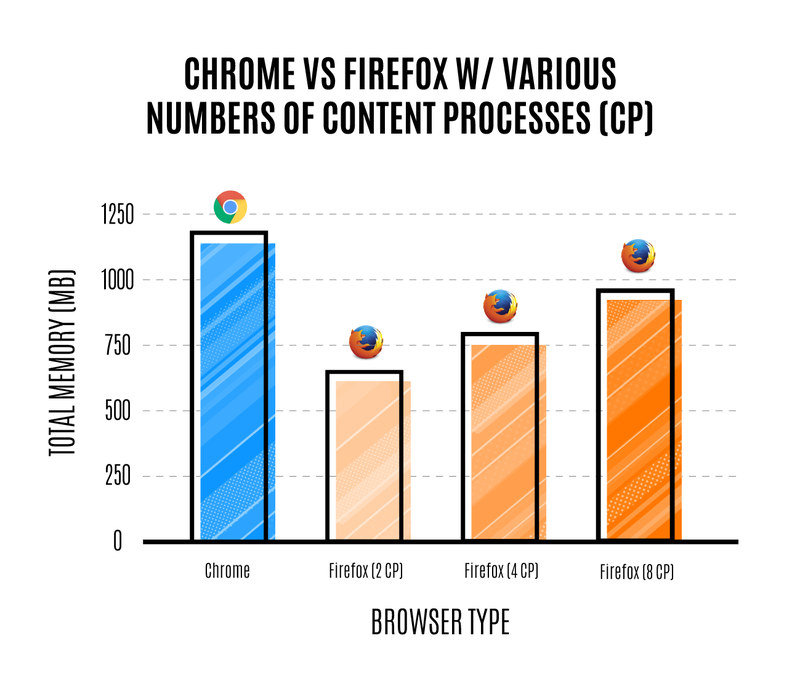 But, in our tests on Windows 10, Firefox uses less memory than Chrome, even with eight content processes running. Are you a tab hoarder? 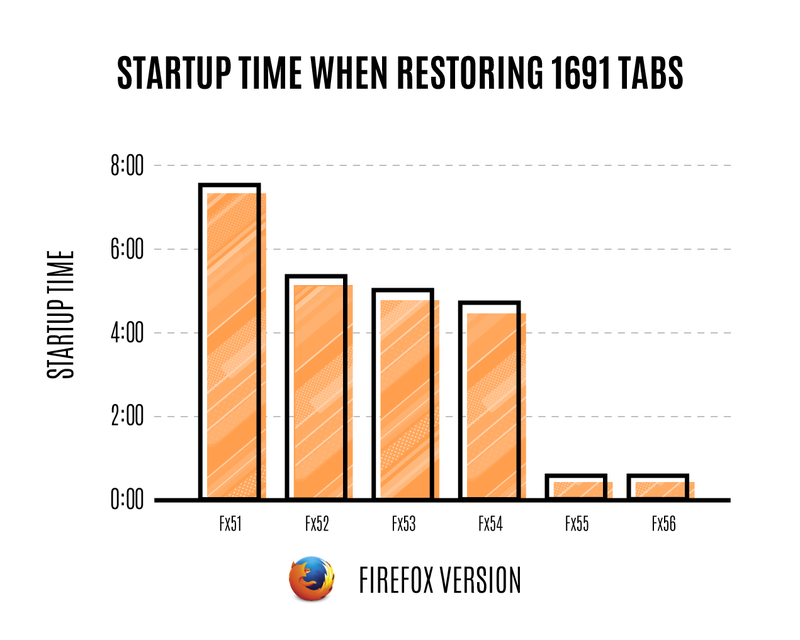 As part of our Quantum Flow project to improve performance, we’ve significantly reduced the time it takes to start Firefox when restoring tabs from a previous session. Just how much faster are things now? Mozillian Dietrich Ayala ran an interesting experiment, comparing how long it takes to start various versions of Firefox with a whopping 1,691 tabs open. The end result? What used to take nearly eight minutes, now takes just 15 seconds. If you’re running the 64-bit version of Windows (here’s how to check), you might want to download and reinstall Firefox today. That’s because new downloads on 64-bit Windows will install the 64-bit version of Firefox, which is much less prone to running out of memory and crashing. In our tests so far, the 64-bit version of Firefox reduces crashes by 39% on machines with 4GB of RAM. If you don’t manually upgrade, no worries. We intend to automatically migrate 64-bit Windows users to 64-bit Firefox in our next release. We’re all searching for something. Sometimes that thing is a bit of information – like a fact you can glean from Wikipedia. Or, maybe it’s a product you hope to find on Amazon, or a video on YouTube. 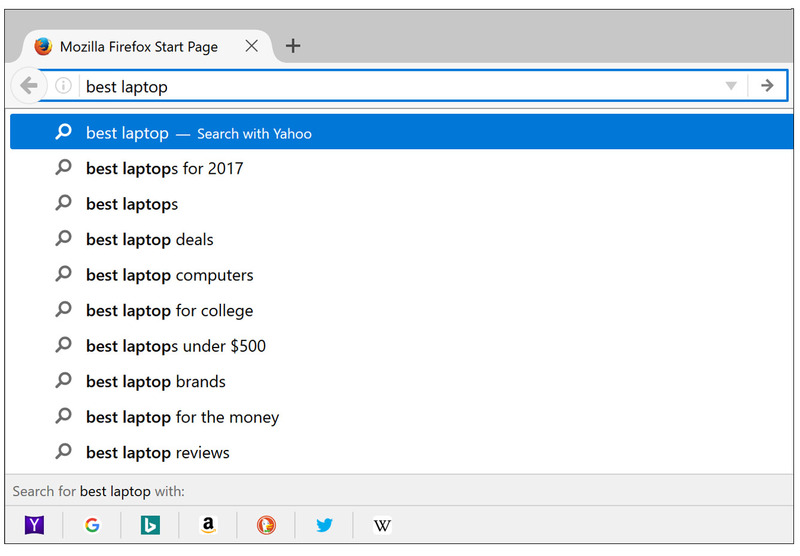 With today’s Firefox release, you can quickly search using many websites’ search engines, right from the address bar. Just type your query, and then click which search engine you’d like to use. Out of the box, you can easily search with Yahoo, Google, Bing, Amazon, DuckDuckGo, Twitter, and Wikipedia. You can customize this list of search engines in settings. Parts of a web page that use Flash must now be clicked and given permission to run. 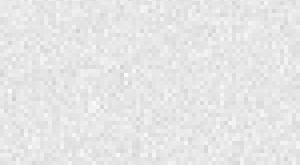 This improves battery life, security, and stability, and is a step towards Flash end-of-life. You can now move the sidebar to the right side of the window. Firefox for Android is now translated in Greek and Lao. Simplify print jobs from within print preview. As usual, you can see everything new in the release notes, and developers can read about new APIs on the Mozilla Hacks Blog. We’ll keep cranking away – much more to come!